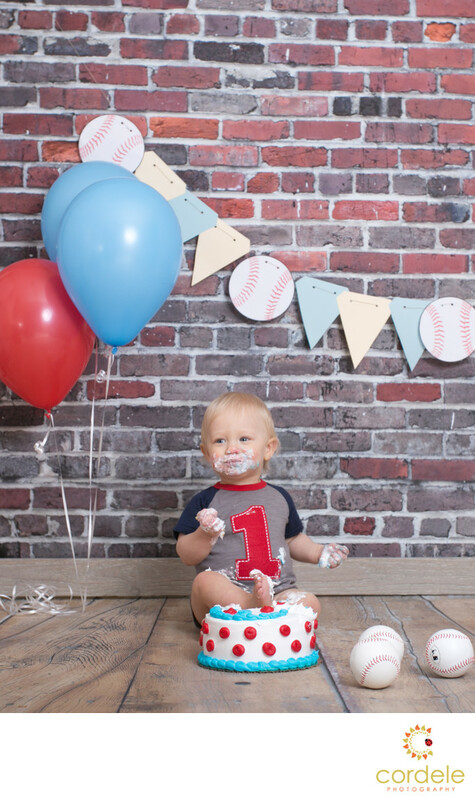 Boys and baseball make for a great cake smash theme. This little boy had a family that loved baseball and they wanted a baseball themed cake smash. I made the banner from paper and cut out all the baseballs by hand. My husband helped me thread the paper on the string, Then all that was left was balloons and the cake. The shirt saying "1" was such a nice touch. Sometimes the candles get lost. We offer these sessions in our studio close to Lynnfield Massachusetts, but whats even better is that we travel on location to do these sessions. We have traveled and set up a studio in people's homes all over the state. Its so easy for us to do!